This is a truly fantastic soup. It might seem a faff, but the result is worth it. I was disappointed with this; I've had much better spiced Moroccan carrots. I didn't have Nadine's pretty carrots with tops, so I cut the large ones I had into chunky batons. Even so, they took longer than her suggested 20 minutes to reach even al dente state, and the sauce didn't reduce as I'd expected. It was OK, and would have been improved with better carrots, but I probably won't bother with it again. Served with the rice and broad bean pilaff. This is such a tasty dish, every time. Once you get over the ingredients list (which goes over two pages on the side note), you realise how quick and easy you can do each of the steps. This has become a staple in our house, and it makes at least 6 generous serves. This is the best recipe for polenta that I know - be generous with the 'mix-ins' and you won't look back. I have served it with the broccoli several times (delicious) but I also don't hesitate to pull it into service as part of many other meals - it was perfect with lamb shanks tonight (sorry, vegetarians). One thing though: I can only assume the 'serves 4' is a typo. I used half the recipe to serve 4 tonight and there is still plenty left over to enjoy as olive-oil fried slices tomorrow. Yum. Delicious dish! As with all of Nadine's recipes I've attempted, if you follow her instructions completely you end up with a fabulous and tasty meal. I made the mistake of buying actual english spinach, and spent a good hour getting the grit out of it before being able to start cooking - I think next time I'll just use baby spinach. Simple to do, and very adaptable -- good if you get a veggie box because you can use pretty much whatever suitable veg you have. There's a summer variation in the book, with grilled vegetables. Non-vegetarians can add mergues or saucisse de Toulouse to the lentils. used cherry tomatoes mixed in with the salad instead of sun blushed (didn't have sun blushed to hand) & mint instead of parsley (all I had) and lime instead of lemon (all I had) and still tasted divine. Used half recipe for just over one main course lunch portion. Naughty Nadine uses yoghurt and lime zest in the method which are not mentioned in the ingredient list, so you need to add these to your shopping list. Nadine Abensur is one of my favourite vegetarian cookbook authors, and she doesn't disappoint here. Like many of her recipes, it's rather elaborate, but in its favour, you can prepare rice and curry in advance and put them together half an hour before the meal. You could vary the vegetables too. Good for feeding a crowd. I'll certainly make it again. This was a bit bland, but would be fine as an accompaniment to spicier dishes, as Nadine Abensur suggests. Don't stint on the coriander. Some grated lemon zest would be good too. I jazzed it up with a glug of fino sherry added at the end. Oh, and I added some bacon, just because I had some to use up, and broad beans without bacon just didn't seem right. this is really yummy. when prepping I thought it may end up being boring lumps of carrot...but everything in it ended up tasting amazing. and really easy to make. highly recommend! This makes a massive cake. It really does take well over an hour to cook through. I'd advise looking at it after 45 minutes and covering with foil if the top is starting to burn. Test right in the middle with a skewer to avoid undercooked centre. Untypically for lemon drizzle, Nadine tells you to heat the glaze to dissolve the sugar before pouring it over. I didn't do this, because the crackly top with undissolved sugar is part of the point. Lovely lemony flavour and (very) moist crumb. Really delicious and so quick to do. Effort vs results 10/10. Orange flower water isn't something I have in the cupboard, but using Cointreau instead of brandy I considered it wasn't necessary. As the recipe specified stem ginger syrup, I used the stem ginger from the jar rather than crystallised ginger. Used Greek yoghurt instead of cream. Like Nadine, I had jars of ageing marmalade to use up. These are not bad; they rose less than expected, but were still light. I liked the fact they weren't too sweet, unlike most muffins; there's no sugar except what's provided by the marmalade, and my home-made marmalade is of the bitter orange variety. The crisp almond top was a nice contrast too. Could be varied by using other types of marmalade/jam; cherry would be good. I bake a lot, and rarely do my baked goods disappear as quickly as these. There is something addictive about them, and they are wonderful to eat, jam-packed as they are with the good stuff. I also find them easy to make (no machinery required, just a bit of chopping, which you can do the day before if that makes life easier). I multiply the recipe by 1.5 and this makes the perfect amount for 12 generous muffins. One caution - they seem to stick terribly to standard muffin papers (the cheese, perhaps?) which wastes a lot of muffin, so last time I used squares of baking paper roughly lining the muffin tins. As well as being perfectly non-stick this also made the end product look great! 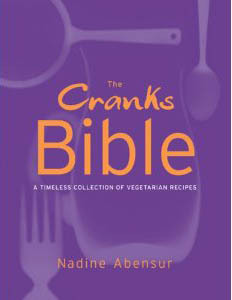 The definitive collection of over 200 healthy and enticing vegetarian recipes from the UK's top vegetarian chef and celebrated Cranks food writer, Nadine Abendsur. Nadine's passion is to create healthy vegetarian food with a modern, delicious twist. A variety of dishes, from tasty snacks to festive Moorish feasts. This is a book of inventive recipes designed for the 21st century.